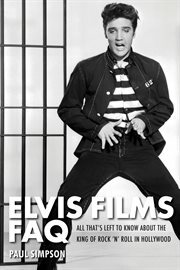 The item Elvis films faq, Paul Simpson, (ebook) represents a specific, individual, material embodiment of a distinct intellectual or artistic creation found in Charlotte Mecklenburg Library. If Elvis Presley had not wanted to be a movie star, he would never have single-handedly revolutionized popular culture. Yet this aspect of his phenomenal career has been much maligned and misunderstood partly because the King himself once referred to his 33 movies as a rut he had got stuck in just off Hollywood Boulevard. Elvis Films FAQ explores his best and worst moments as an actor, analyzes the bizarre autobiographical detail that runs through so many of his films, and reflects on what it must be like to be idolized by millions around the world yet have to make a living singing about dogs, chambers of commerce, and fatally naive shrimps. Elvis's Hollywood years are full of mystery, and Elvis Films FAQ covers them all! Which of his own movies did he actually like? What films did he wish he could have made? Why didn't he have an acting coach? When will Quentin Tarantino stop alluding to him in his movies? And was Clambake really the catalyst for his marriage to Priscilla? Elvis Films FAQ explains everything you want to know about the whys and wherefores of the singer-actor's bizarre celluloid odyssey; or, as Elvis said, "I saw the movie and I was the hero of the movie."